The idea of this article came from a recent photo series I saw on BoredPanda about viral photos people thought were real but were fake. It reminded me of some of my photos people always call fake. People online judge you really easily. It used to really annoy me when people called my work ‘fake’ when I spent countless hours planning and executing that particular shot. Now I don’t care as much anymore as I used to. This is the Internet, after all. And if I think about it, often I can’t blame them. Take the last super moon for example. More than half of the pictures you see online are indeed fake. 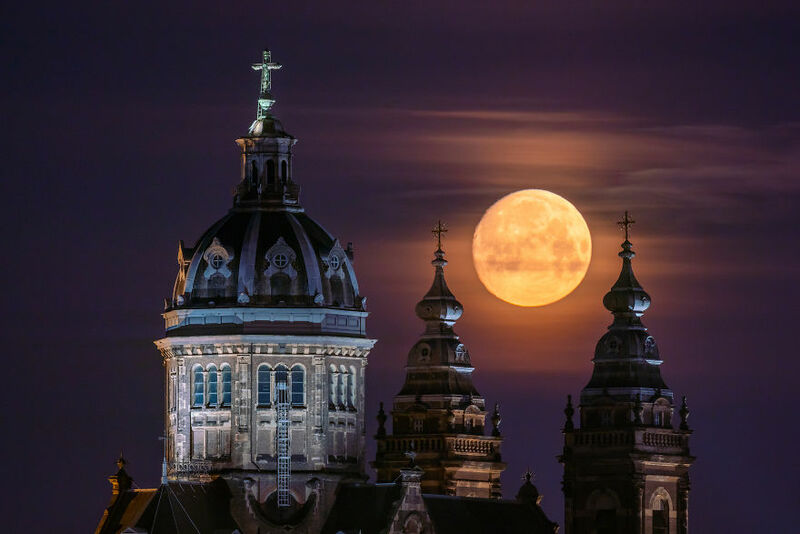 People paste the moon in all kinds of settings, and if you know your photography, you can easily see what’s fake and what’s not because of focal lengths not matching. However, people who don’t really know the technical aspects of focal lengths, the ‘general crowd’ can’t really tell what’s real and what’s fake. So if something looks ‘too good’ people often think it’s fake. The so-called ‘haters’, in particular, will scream fake at you and will sometimes even directly insult you. In this article, I will discuss a few shots I’ve taken over the years that look ‘unreal’ and thus were hated upon a lot. All the shots I am discussing have their own separate articles on how they were shot on my website as well. AR Integrations + Team License + Email Club (100 emails a month) for $17 per month for 12 Months. I do have to say that all of my shots are indeed ‘Photoshopped’. I always work on my images to make them look good on print and social media. I change contrast, vibrance, saturation, make color adjustments, etc., so you can call them ‘fake’ in that regard. But I don’t change the moment. When you shoot in RAW format you maximize the data your camera can capture. The photos always come out very flat, so to make it look somehow appealing you have to do some processing. When you shoot in JPG, or when you shoot with your smartphone, for example, the device itself already does all the processing so you don’t need to do any processing on the computer anymore. This is an endless discussion that I will not write about in this article, but can be talked about another time. The bottom line for me, in general, is trying to display the moment in a photograph. To close, I would like to say that before you judge anyone or think something is fake, don’t just start screaming “fake!” or insult the photographer. If you have doubts, there is sometimes more to it than you think. No matter how much experience I have with this particular thing, it still hurts when people insult me over work I spent lots of time on. For more info about all the shots, feel free to check my other articles on BoredPanda or on my website. This photo gave a boost to my photography career. 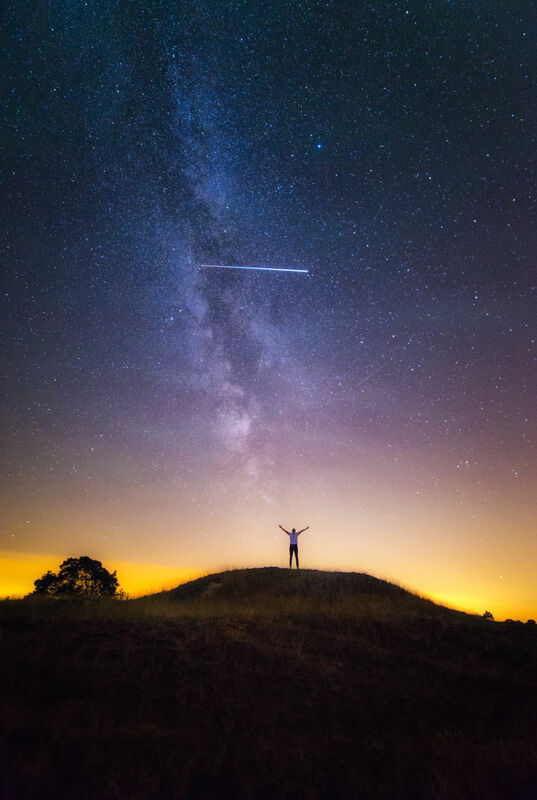 It shows the ISS (International Space Station) flying over a friend of mine standing on a hill who I was photographing with the Milky Way. This was a lucky shot. I had been to this area a bunch of times trying to shoot the Milky Way (which is not easy in the Netherlands) and this on this shot I saw something flying through the frame. Upon doing research afterward and asking local astrophotographers (on astroforum.nl, very nice and helpful guys) it was confirmed that this was indeed the ISS flying through my frame. I already knew it was something special when I took the shots, because it was flying much slower than a shooting star, and it was much brighter than a meteor and different than a plane. A meteor shower was predicted one week later, and with some clever title, a photo story and the image itself, the image spread on the Internet extremely quickly. The result was tons of media attention, and a lot of people calling the shot fake for numerous reasons. Most common were the people who don’t know anything about photography saying you can’t see or photograph the Milky Way in the Netherlands. There were ‘Experts’ saying the ISS flew a different direction so the shot could not be real. But they forgot that the exposure started when the ISS was on the right, and that’s why it’s brighter there. And it went to the left, fading out there because it was making its turn there. So while it looks like the ISS is going to the left, its actually going to the right. There were also haters saying the shot was planned (but not calling it fake) and saying I made up a bulls**t story. At that time I tried everything to convince everyone the shot was real. Luckily I also had support from people from astroforum.nl, and I showed some publishers the raw file. But you simply can’t please everyone. My most recent picture that I planned of the supermoon was also called fake by some people, especially people who don’t really know photography. As I mentioned earlier, you can’t really blame them, because there were so many fake moon shots out there. For many people, a shot like this is again “too good to be true.” The perfect alignment of the moon in between the two towers screams Photoshop. But the challenge is to plan shots like this, and once you tell people how you do it, they turn around. People calling it fake because the moon is too big. By using a very long lens and planning you can align the moon with building and objects. It’s great fun when you succeed. People were also calling it fake because there are hundreds of fake pictures of super moons out there, even featured by news channels. These two images are by far the most extreme. 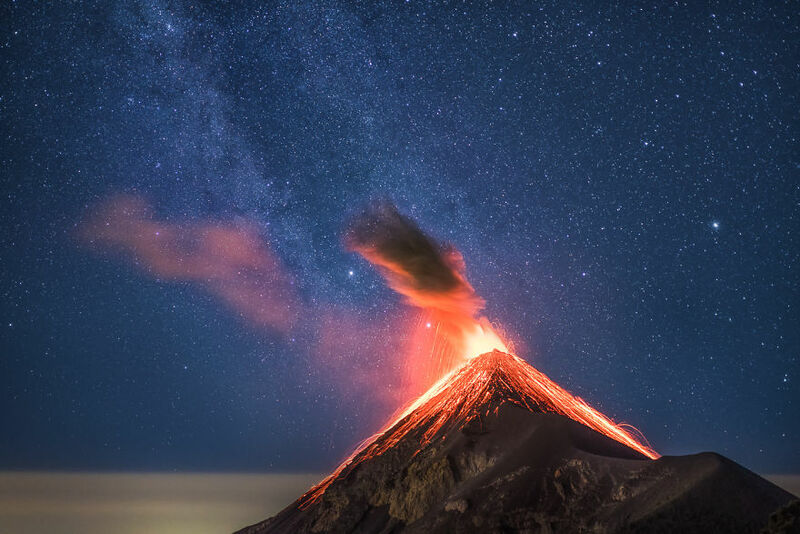 Especially the first image where you can see the Milky Way in line with an erupting volcano in Guatemala. The second image was actually much more challenging, but the first image looks way crazier so that one gets a lot of hate, even today. I planned this shot to great lengths and before I made the shot. I already told lots of people about my plan, making it even more satisfying when I was finally able to take this shot. Literally, hundreds of people insulted me over this particular shot. First, the top of the peak on the left. Lots of people said it looked horrible. “Such a bad Photoshop,” was often said. The fact is that the peak right there is rising above a thick fog layer, making it look like that. If I had Photoshopped that, I probably would have made it look better! Because of the very defined haze layer, it looks like the sky is just pasted in the image. What people forget is that I am standing at close to 4,000 meters (13,000 feet) of altitude here. The haze layer was very apparent that night. Compare it to being in an airplane at high altitude and looking out of the window — you’ll also often see a very defined line of the atmosphere. People also said: “The light pollution looks very strong, but the sky is not polluted.” This is Guatemala. What you see in the image are very small villages. They almost don’t give off any light pollution. It just looks way more extreme on the image because of the long exposure. 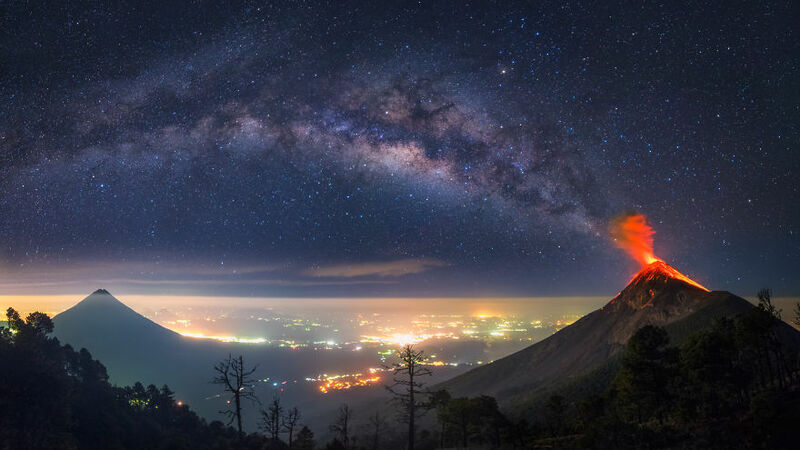 You can see this on a light pollution map if you check the surroundings of the Fuego volcano in Guatemala. There is not much light pollution, so it’s very easy to spot the Milky Way. I shot the erupting volcano with the Milky Way first and then moved panned to take more shots to get the whole Milky Way with the valley. There were a total of 5 (vertical) shots. No HDR, bracketing, or whatever. But yes, multiple shots to create the full panorama. The second more challenging photo is a single exposure.